Royal baby No. 3 is here! 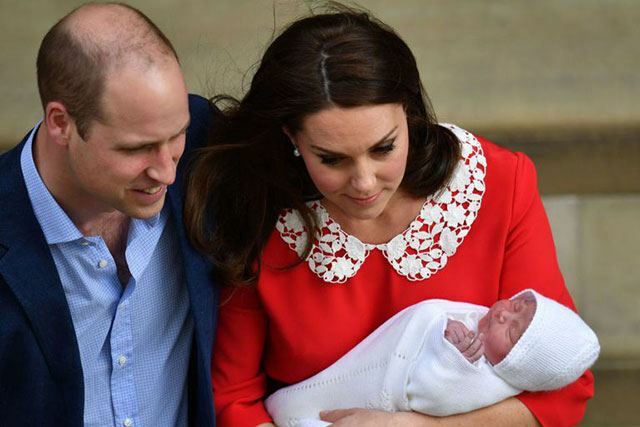 Kate Middleton and Prince William welcomed their third child on Monday, April 23, 2018 at 11:01 a.m. in the Lindo Wing at St. Mary’s hospital. Just like when Prince George and Princess Charlotte were born, the Duke and Duchess of Cambridge stopped for a few quick photos in front of the hospital before they returned to Kensington Palace with their new prince. 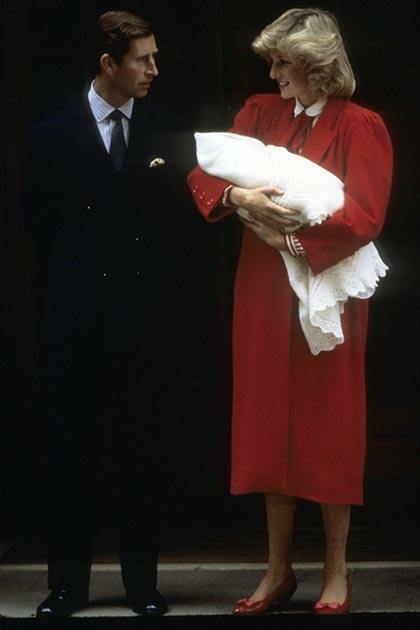 Kate wore a red dress with a white lace collar by Jenny Packham, making this the third time she's worn a bespoke dress by the British designer for her post-birth appearances. 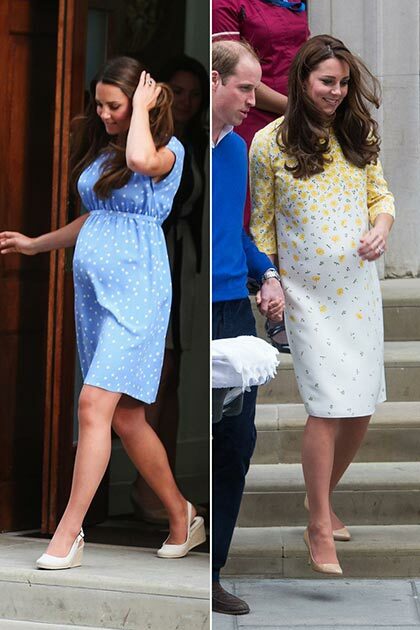 When Princess Charlotte arrived in May 2015, Kate opted for another pastel Jenny Packham number, but this time her yellow dress in a buttercup print had longer sleeves to accommodate for the cooler spring weather just like the red dress did today. Princess Charlotte also wore a knit cap when she went out into the world for the first time, while Prince George enjoyed the July weather sans-hat on his first outing. 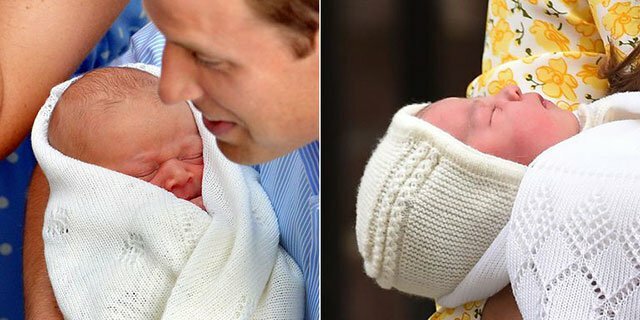 Both royal babies were swaddled in a white soft wool baby shawl. 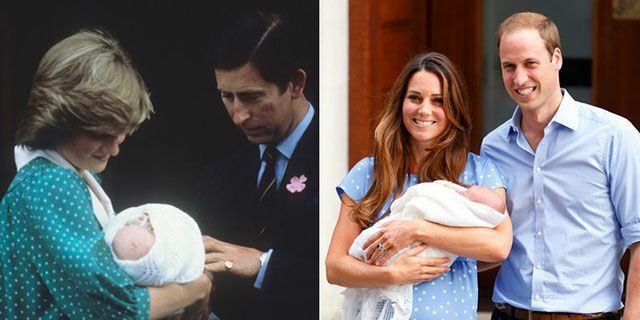 Since the weather in London was rather cold and windy today, the new prince also wore a knit cap and what appears to be the same baby shawl as his siblings. The previous two times Kate stepped out with her newborns she wore light-colored heels, but her sling-back espadrilles were better suited for the July weather than the leather Jimmy Choo pumps she wore to introduce Charlotte. Kate went for neutral shoes once again with baby no. 3, opting to re-wear what appears to be her Gianvito Rossi "Gianvito 105" pumps in taupe suede. 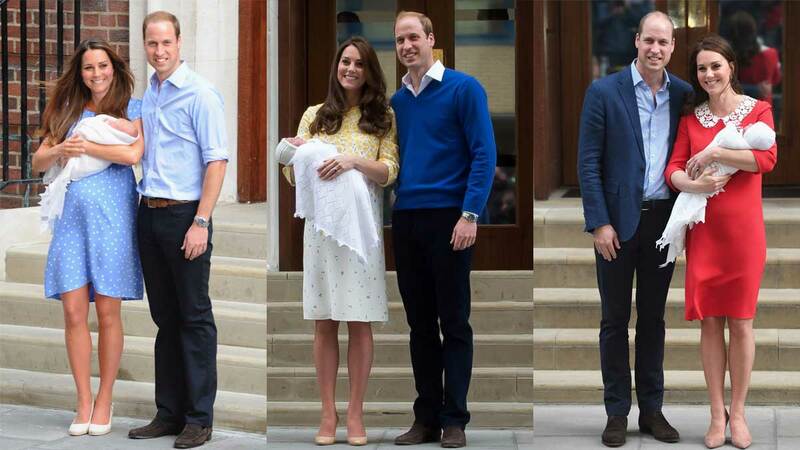 Today, Prince William brought both Prince George and Princess Charlotte to meet their new little brother. 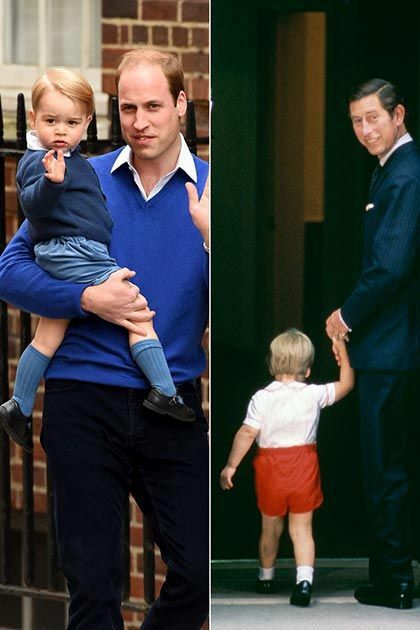 This time around George didn't match with his father, since he came straight from school wearing his uniform. 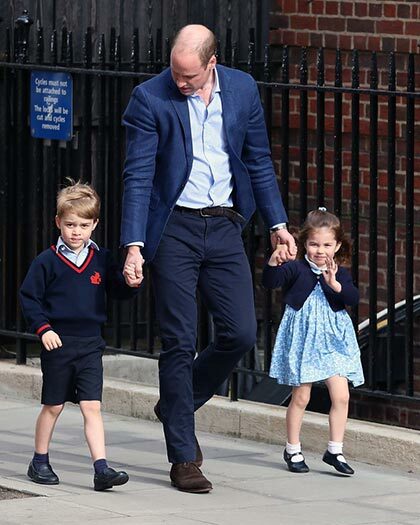 Charlotte, however, was dressed for the occasion in a blue floral print dress and stole the crowd's heart by showing off her royal wave, while Prince George was a little more shy this time around.